If you have had a destination wedding, and you and your husband are planning on having a reception after and would like to wear your dress, (Which we say YES! You should! ), we can do that for you! We can have you ready to make your grand entrance to your reception looking amazing! Are you thinking of wearing your Mother’s wedding gown, and having it updated? But it looks yellowed, even though it’s been “preserved”. We can help with that! We can also add new life to veils by brightening them up so they are “aisle wearing” ready! 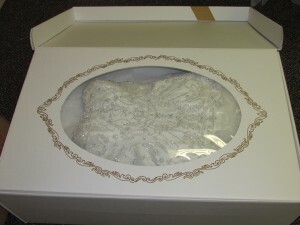 We also offer wedding gown preservation services. We do it in a 2 step process, allowing you to see the dress before it is put into the preservation box, so you know how clean it is before it goes in there. If you want to preserve your beautiful gown for next generations as a family heirloom we can do that for you.